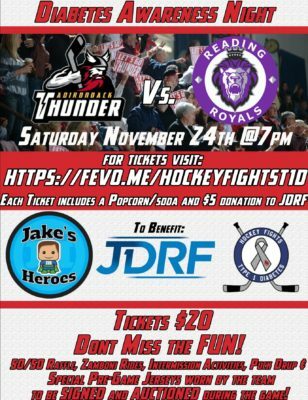 We are pleased to announce that we have partnered with the Adirondack Thunder and Jake’s Heroes for a Hockey Fights Type 1 Diabetes event on Saturday November 24th, 2018. 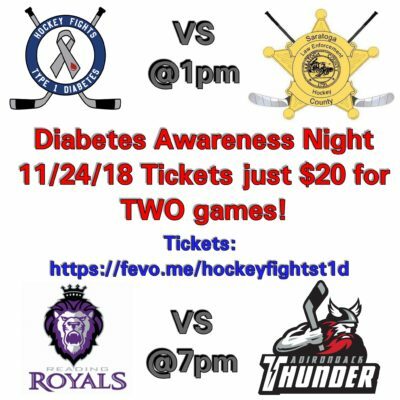 We will be starting the day off with a game between Hockey Fights T1D and the Saratoga County Law Enforcement Hockey team at 1pm. Later in the evening, the Adirondack Thunder will take on the Reading Royals for their only Saturday home game during the month of November (as if you needed another reason to attend!). The Thunder will be hosting a bunch of promotions throughout the night including free Jake’s Heroes t-shirts to the first 1,000 kids 14 and under, specialty warmup jerseys featuring the logos of Jake’s Heroes and Hockey Fights T1D. The jerseys will be available for fans to bid on through a silent auction during the game. If you purchase a ticket via our fundraising link you will receive free popcorn and a soda. In addition, $5.00 from every ticket sold using the fundraising link will be donated to the JDRF. 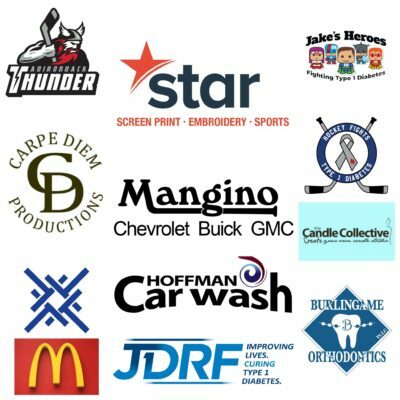 We would like to thank the following sponsors for helping us provide the free shirts to the kids. Your generosity definitely takes this event to another level!